A. All materials contained on the Web Site are Copyright November 2, 2009, Sakura Silk, Inc. All rights reserved. 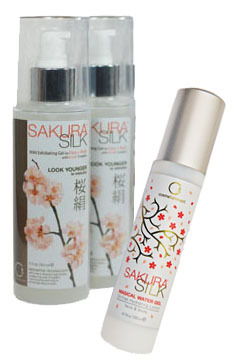 C. Sakura Silk, Inc and other trademarks and/or service marks (including logos and designs) found on the Web Site are trademarks/service marks that identify Sakura Silk, Inc and the goods and/or services provided by Sakura Silk, Inc. Such marks may not be used under any circumstances without the prior written authorization of Sakura Silk, Inc.
Sakura Silk, Inc may provide hyperlinks to third-party web sites as a convenience to users of the Web Site. 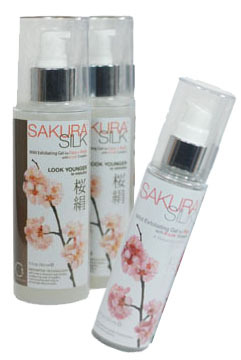 Sakura Silk, Inc does not control third-party web sites and is not responsible for the contents of any linked-to, third-party web sites or any hyperlink in a linked-to web site. Sakura Silk, Inc does not endorse, recommend or approve any third-party web site hyperlinked from the Web Site. Sakura Silk, Inc will have no liability to any entity for the content or use of the content available through such hyperlink. 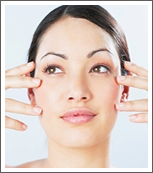 The information and materials on the Web Site could include technical inaccuracies or typographical errors. Changes are periodically made to the information contained herein. Sakura Silk, Inc MAKES NO REPRESENTATIONS OR WARRANTIES WITH RESPECT TO ANY INFORMATION, MATERIALS OR GRAPHICS ON THE WEB SITE, ALL OF WHICH IS PROVIDED ON A STRICTLY "AS IS" BASIS, WITHOUT WARRANTY OF ANY KIND AND HEREBY EXPRESSLY DISCLAIMS ALL WARRANTIES WITH REGARD TO ANY INFORMATION, MATERIALS OR GRAPHICS ON THE WEB SITE, INCLUDING ALL IMPLIED WARRANTIES OF MERCHANTABILITY, FITNESS FOR A PARTICULAR PURPOSE AND NON-INFRINGEMENT. UNDER NO CIRCUMSTANCES SHALL THE SITE OWNER OR PUBLISHER BE LIABLE UNDER ANY THEORY OF RECOVERY, AT LAW OR IN EQUITY, FOR ANY DAMAGES, INCLUDING WITHOUT LIMITATION, SPECIAL, DIRECT, INCIDENTAL, CONSEQUENTIAL OR PUNITIVE DAMAGES (INCLUDING, BUT NOT LIMITED TO LOSS OF USE OR LOST PROFITS), ARISING OUT OF OR IN ANY MANNER CONNECTED WITH THE USE OF INFORMATION OR SERVICES, OR THE FAILURE TO PROVIDE INFORMATION OR SERVICES, FROM THE WEB SITE.